Sweet Potato Coconut Curry Soup. Remember back in January when I said I’d write about some of the cookbooks I had acquired at my cookbook swap? I’ve finally gotten around to cooking out of some of them! I like the idea of eating vegan. I aspire to serve a vegan meal at least one weekly, if not more. I’ve talked here before of how we don’t eat a lot of meat, but dairy is an entirely different matter. There’s no way I’m not using real milk in my coffee, but I can cut back on the amount of cheese I depend on as a protein component in our diet. Admittedly, I’ve been lazy about it in recent months, but with dairy prices on the rise, the more I cut out, the better for our pocketbook & our bodies. I pulled out my new Easy Vegan cookbook yesterday afternoon & was determined to make something from it. I realized I had most of the ingredients on hand for ‘sweet potato & coconut soup with Thai pesto’ and so went for it. 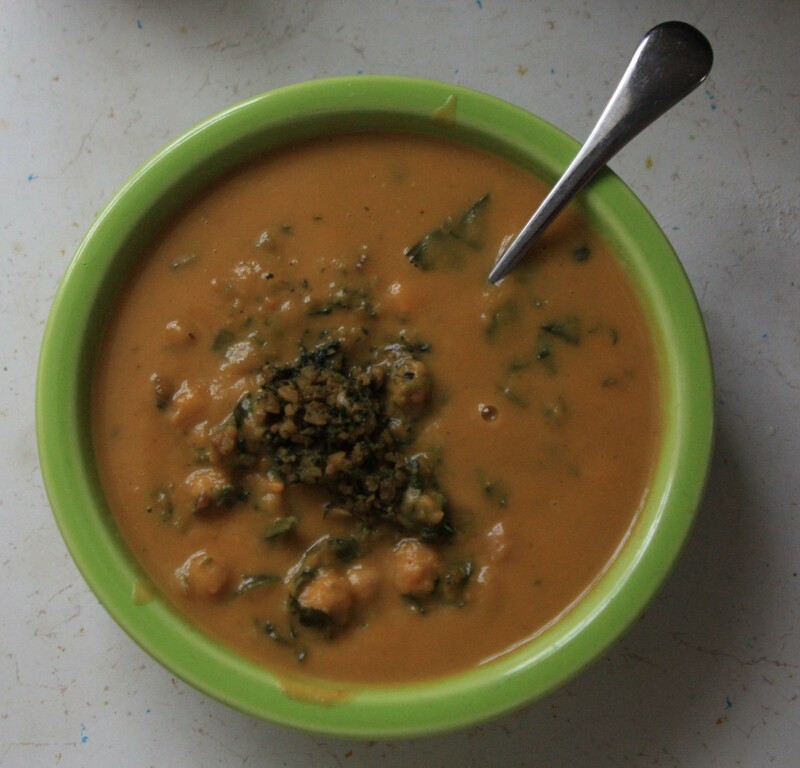 The photo in the cookbook of the slightly chunky soup looked to me like it had chickpeas in there, so that was the launching pad I used to make this soup my own. I’m sharing the ingredients for the Thai pesto as listed in the original recipe, although admittedly on a cold, snowy day in March, I did not have them all per se. I subbed lemon basil from the freezer for the basil, cutting back a notch on the lime juice. I used dried mint from the garden from the tea cabinet for the fresh mint, which currently is just barely peeking through the dirt (we’re not going to talk about how it is buried under several inches of snow). I used some chili paste from the Asian food store in lieu of chilis. Pat thought the pesto could have used more soy sauce & less sugar – btw, I used a pinch of sugar & not a tablespoon. This pesto was still pretty darn tooting good despite all my substitutions. One last note – the original recipe called for Thai red curry paste. I only had green on hand & discovered long ago you can easily substitute red for green & vice versa. The resulting dish will still have mostly the same flavor, although the end color could be slightly different. Put oil in a heavy-based saucepan and set over medium heat. Add the sweet potato & onion, partially cover with a lid and cook for 15 minutes, stirring frequently, until potatoes are soft. Add curry paste & stir fry for a few minutes until paste becomes fragrant. Add coconut milk & enough stock to cover the sweet potatoes (2+ cups). Increase heat & bring to a boil. Cook until the sweet potatoes are fully softened. Remove from heat, puree mixture until smooth & return to pot. Add chickpeas, spinach & salt, cooking until the spinach wilts. Serve with generous spoonfuls of Thai pesto on top. Put all ingredients in food processor or blender and whizz, occasionally scraping sides down, until you have a chunky green paste & all ingredients are uniformly chopped. A tale of chicken soup. I’ll have to look that up & try it out! I was sort of amazed with my cooking talents as I ate it.